Quasars are galaxies with massive black holes at their cores around which vast amounts of energy are being radiated, more than from the rest of the entire host galaxy. Their luminosities allow quasars to be seen at cosmological distances and they are therefore likely candidates for strong lensing, with a few hundred gravitationally lensed quasars known so far. They have provided valuable information not only about quasars and lensing but also on cosmology since the distorted light paths of the distant objects have traveled across cosmological distances. CfA astronomer David James was a member of a large international team systematically searching for new gravitationally lensed quasars. They used the WISE infrared all-sky survey to search for candidates whose infrared colors suggested they were galaxies with active nuclei (like quasars). They processed images of these candidates with a sophisticated algorithm looking for evidence of their being multiple components, such as would be expected from a lensed system, and then followed up this subset with spectroscopic and ground-based imaging observations using higher spatial resolution than WISE. Of the original set of fifty-four candidates, they found two whose spectra confirmed that they were gravitationally lensed quasars, one with four sub-images and one with two, each of whose light has been traveling towards us for about ten billion years. 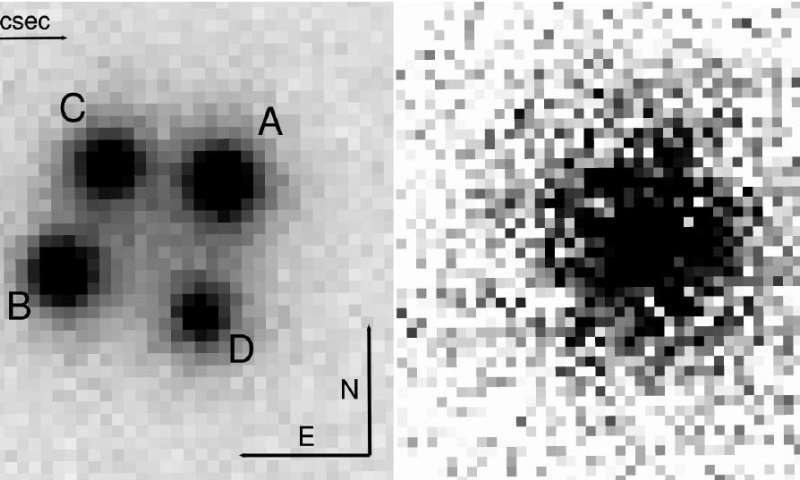 The images in these two cases also showed traces of the lensing galaxy, an important verification of the lensing effect, although the galaxies were too faint to obtain measurements of their distances. The scientists also identified another seven objects that are likely to be doubled-quasars, but further research is needed to confirm those results. This does away both with dark matter and also dark energy. This also explains gravitational rotational rates without the need of dark matter. Galaxies, dust, and gas are pushing against each other; this repulsion holds outer stars in place, explaining higher than expected rotation. I think that General Relativity can be adjusted such that we keep time dilation, BUT ditch curved or dilated space. I.e. we should work with flat, 3D , Euclidean space + time dilation. I explain about this in the notes at the bottom of the article. Total nonsense. 1.5 M ly from where? Brilliant! Can we see the maths, please? Where is this woo written up? I need to inspect it. If it is beyond my pay grade, then I will post it on a physics forum. Let's just see the actual woo, so that I can do such a thing. Don't hold your breath. Joe may have tried to get to the universe where his conjecture is possible and he no longer exists. Just keep working on getting your theory to work will give the naysayers a black eye.